Sicilian | Have YOU Ben Starr Struck? 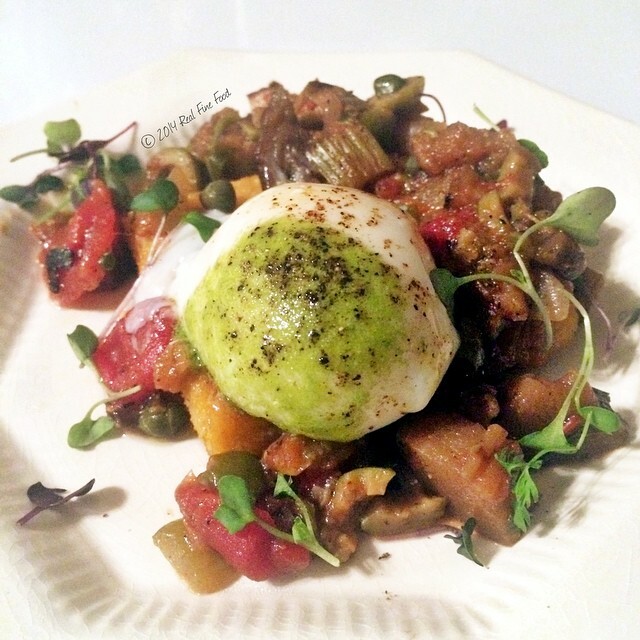 Photos in this blog appear courtesy of our friend Stephanie Casey at Real Fine Food. Follow her on Facebook and Instagram, also! With FRANK pulling in some crazy press recently (a Dallas Morning News article called us “The Best Restaurant in DFW” and Modern Luxury featured us with 3 other restaurants as “Best of the City”), the pressure has been on to do MORE of them. “Why not try 8 seatings for the next one?” Jennie proposed. We had never done that before. 7 was the max. We’re never afraid of a challenge, so 8 it would be. 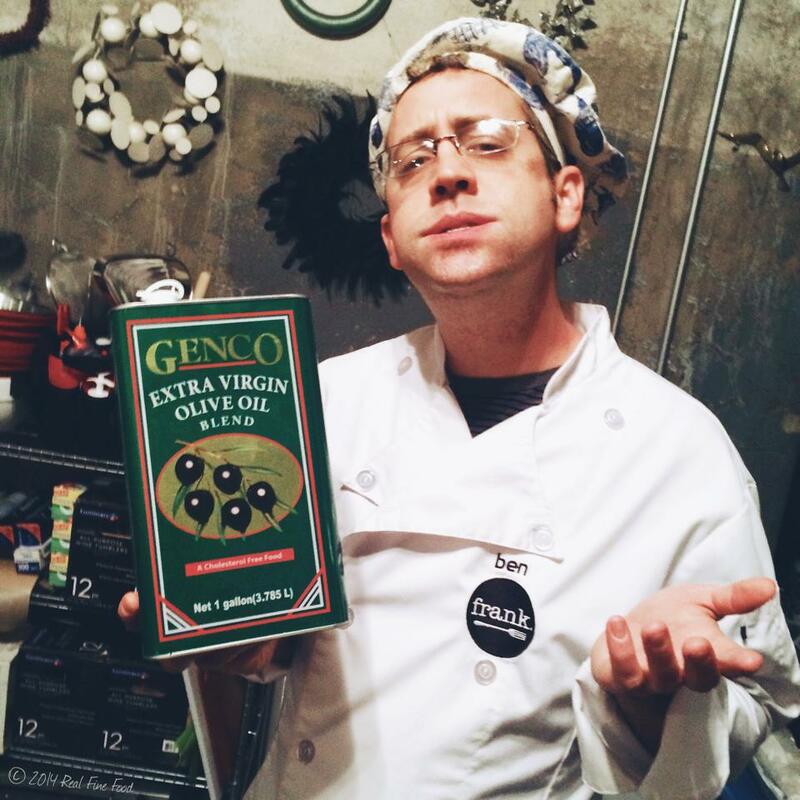 Yours, truly, as Don Vito Corleone, with an actual bottle of the Corleone family's "real" business: Genco olive oil. Photo courtesy of Stephanie Casey. We’ve developed a tradition of hosting an Italian feast at FRANK every winter. While Italian is great in any season, there’s just something about the gray, dreary winter that makes you crave pasta and spicy tomato sauce and crusty bread and good red wine. Adrien, who has now become a FRANK fixture, and Jennie were sitting around tossing out menu ideas one night and The Godfather came on TV. For both of them, NOTHING is more important than The Godfather, so menu planning stopped while they watched the film…until they got to the spaghetti and meatballs scene, and they both simultaneously screamed, “FRANK GODFATHER!! !” We had long been tossing around the idea of menus inspired by our favorite films and bands, so it seemed to be a perfect fit. 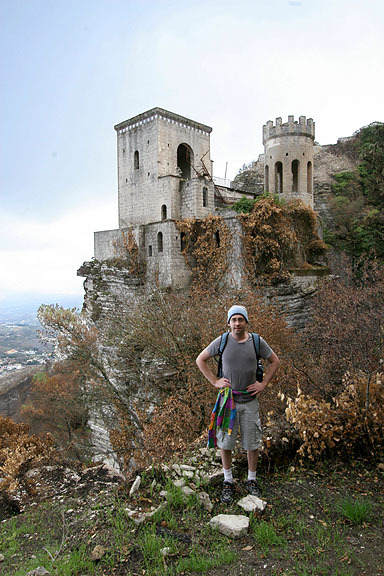 Yours, truly, below a crumbling fairy-tale castle perched on a rock crag in Erice, Sicily. Sicily is my favorite European travel destination. Castles, Greek temples, Norman ruins, beaches, volcanoes, wine, cheese...and almost no tourists. So all that really remained was for me to watch The Godfather for the first time. 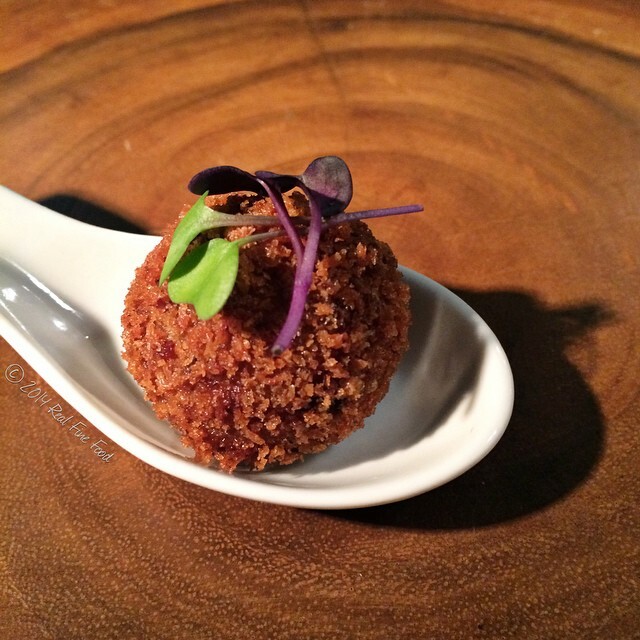 Wild Mushroom and White Truffle Arancini. Photo courtesy of Stephanie Casey. 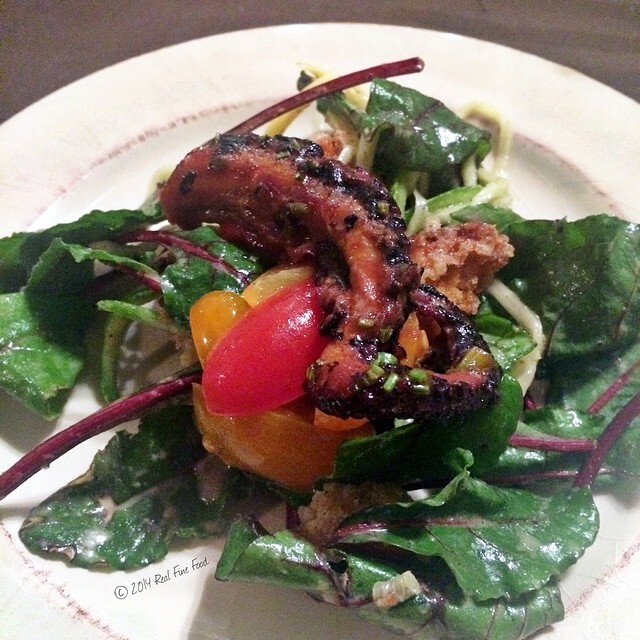 Octopus and beet green panzanella. Photo courtesy of Stephanie Casey. 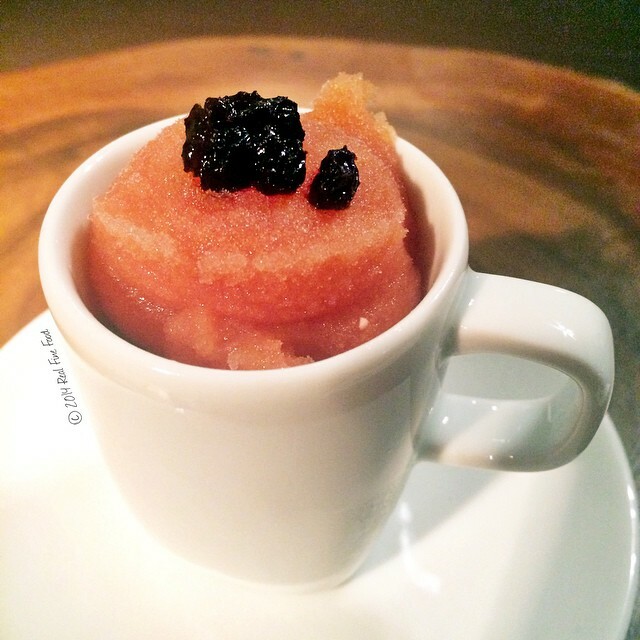 Blood Orange Brandy Sorbet. Photo courtesy of Stephanie Casey. And now…the main course. In Italy, meals have a very specific structure. First comes the antipasto, or appetizers, then comes the primo or first course, which is usually pasta (but can be soup, polenta, risotto, etc. ), and then comes the secondo or primary course, which is the meat course. Pasta is almost NEVER served as the main course in Italy. But we did it, because of The Godfather. There’s not much actual cooking in the Godfather, but there’s a famous scene where Clemenza is teaching Michael to make spaghetti and meatballs…because if he ends up in prison, he’ll need to know how to cook for the boys. When Coppola was adapting Mario Puzo’s book, he really wanted to keep the spaghetti and meatballs scene intact, because he wasn’t entirely certain the film would be a success. He mentioned, “If it’s a flop, at least the audience will know how to make a decent spaghetti sauce!” We knew our main course HAD to be spaghetti and meatballs, and in true FRANK fashion, everything had to be from scratch. 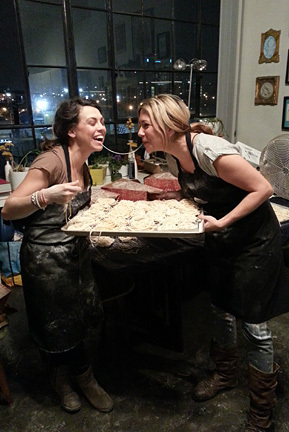 Ever made homemade pasta for 160 people? No easy task. It took us an entire day, assisted by our lovely server Lindsay, who is also a brilliant chef herself. By the time we were done, it looked like a cocaine deal gone terribly wrong…the loft was absolutely covered in flour! 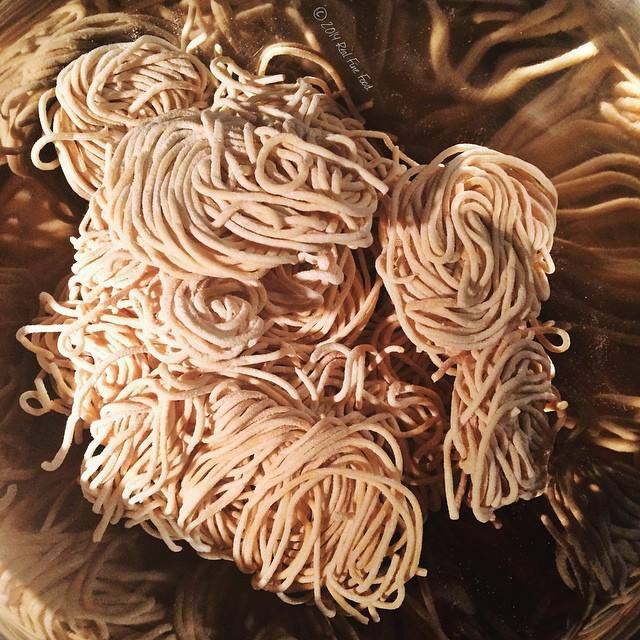 Housemade pasta. Photo courtesy of Stephanie Casey. The sauce would have to be truly epic. Chef Jennie chose the “arrabbiata” style, which is a bold, spicy sauce of tomato, garlic, and red chili flakes. Making tomato sauce in Texas in December always necessitates turning to a can of tomatoes…it’s actually really hard to get tomatoes worthy of a sauce at ANY time of year, even when you have tomatoes in your garden and let them ripen on the vine. The best sauce tomatoes are varieties with a high flesh/low moisture content, like Romas and other plum-shaped tomatoes. You definitely don’t want a “juicy” tomato when making sauce. The big beefsteak tomatoes have too much liquid and too many seeds to make a superior sauce, and that’s what most of us raise in our gardens. Luckily, the best sauce tomatoes in the world are grown in the Campagnia region of southern Italy, near the town of San Marzano sul Sarno, and are widely available around the world…though definitely not inexpensive. I get really annoyed when people turn up their noses at a sauce made from canned tomatoes. Most canned tomatoes, in particular San Marzanos, are allowed to vine ripen and are canned immediately after picking. On the other hand, ALL supermarket tomatoes, the vast majority of Farmer’s Market tomatoes, and even many home grown tomatoes, are picked from the vine before ripening, and allowed to ripen off the vine. This results in a totally different texture, flavor, and sugar profile than if they were allowed to ripen on the vine. I can make you a far better tomato sauce from the cheapest can of tomatoes than I can from the best-looking and most expensive tomatoes in the produce section of the grocery store. Every single time. So unless you have a source for vine-ripened, just-picked plum tomatoes grown in perfect soil in a perfect climate, don’t ever EVER think less of someone for using canned tomatoes in a sauce! Incidentally, the omnipresent “Roma” tomato is a hybrid of the San Marzano variety, bred for a thicker skin (ie, easier transport from farm to market). This may have been the best tomato sauce I’ve ever had, Jennie nailed it. Housemade spaghetti, arrabbiata sauce, veal meatballs. Photo courtesy of Stephanie Casey. One of our first-time diners later confessed to me, “I was expecting FRANK to be this super fancy thing from your reviews, and when you sent me the menu the night before and I saw that the main course was spaghetti and meatballs, I almost didn’t come. 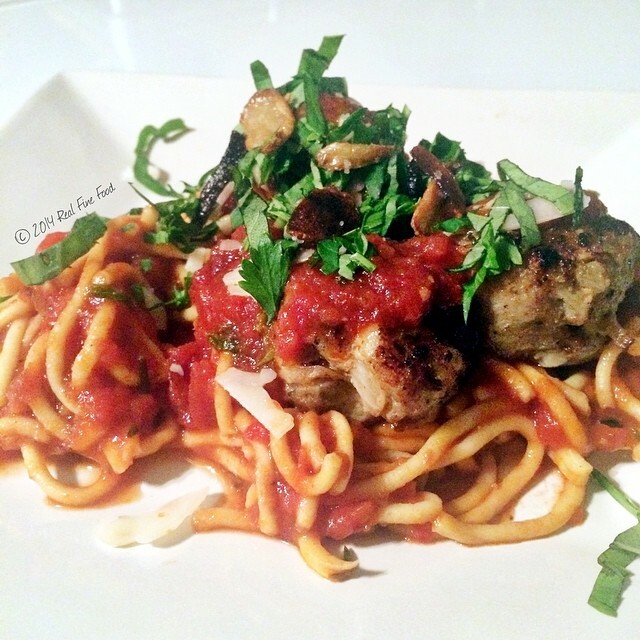 But this is the BEST spaghetti and meatballs I’ve EVER had…can I have some more?! ?” I really loved that moment. Jennie and I never set out to make FRANK this ultra-sophisticated restaurant serving only haute cuisine. Our mission statement says, “Our recipes are inspired by classic, traditional preparations, enriched by our collective creativity from years of travel and kitchen adventures. 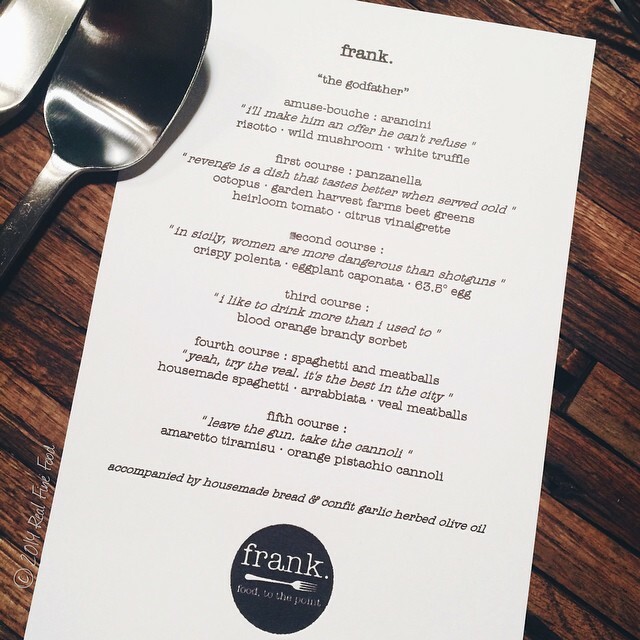 FRANK is food…to the point.” This cuts to the very heart of my own personal food philosophy. Some creative chef can come up with a new flavor combination and preparation, and it may be extraordinary and inspiring and incredibly delicious. But it will NEVER have the impact on another human as a recipe that comes from their family history, something they’ve eaten since they were a child, prepared by those in their life who loved them the most. A plate of spaghetti and meatballs will have more meaning to more people in this country than anything Jennie or I could dream up out of our own originality. So rather than take the route that many chefs take…forging their own unique culinary legacy…we tend to focus on taking the foods that already have a centuries-old legacy, and making them as perfect and delicious as they can possibly be. This is what sets FRANK apart from other restaurants of its type and price range. FRANK is less about FOOD and more about PEOPLE. Yes, the food is delicious. But when you read our reviews, you’ll find, time and again, that people leave the experience raving about the EXPERIENCE. The people they met and shared the evening with. And that is fostered through the food. Jennie loves to refer to FRANK as a culinary sociological experiment, rather than a restaurant. And I couldn’t agree more. Dessert. When I posted on Facebook that we were doing a Godfather theme, virtually every comment mentioned the famous cannoli scene. Clemenza and his henchman Rocco are ordered to kill long-time friend and family chauffeur Paulie for betraying the Godfather. After Rocco shoots Paulie, he asks Clemenza what to do next, and Clemenza carelessly says, “Leave the gun…take the cannoli.” (Little known fact…the actor that played Clemenza improvised that line, it wasn’t in the script, and it became one of the most-quoted and iconic lines of the film.) So we knew we HAD to have cannoli on the menu. (Quick Italian lesson…”cannoli” is actually plural, so if you have only one, you have a “cannolo”…or, if you’re in Sicily which has its own distinct dialect, a “cannolu.” There is no such thing as “a cannoli,” that’s akin to saying, “I’m going to eat a cupcakes.”) Cannoli are an iconic Italian dessert made of a crispy shell of fried pasta dough, filled with lightly sweetened ricotta. They are a ridiculous amount of work, which is why they are typically only sold at specialty bakeries. The pasta dough is like any other pasta dough…primarily flour and eggs, but instead of adding water to hydrate the dough, you add Marsala…a sweet dessert wine from Sicily. This gives the dough a hint of sweetness and complexity. We let the dough rest for a day in the fridge to fully hydrate, then rolled it thin in the pasta machine before wrapping around specialized stainless steel cannoli molds, sealing together with egg white, and deep frying until crisp. Then you have to immediately remove the shell from the mold or it will stick to it…not an easy task when you’re dealing with a 320 degree piece of metal! Just before serving, we filled the shells with ricotta which we lightly sweetened and scented with orange zest and vanilla. And each end was dipped in pistachios, the quintessential Sicilian nut. 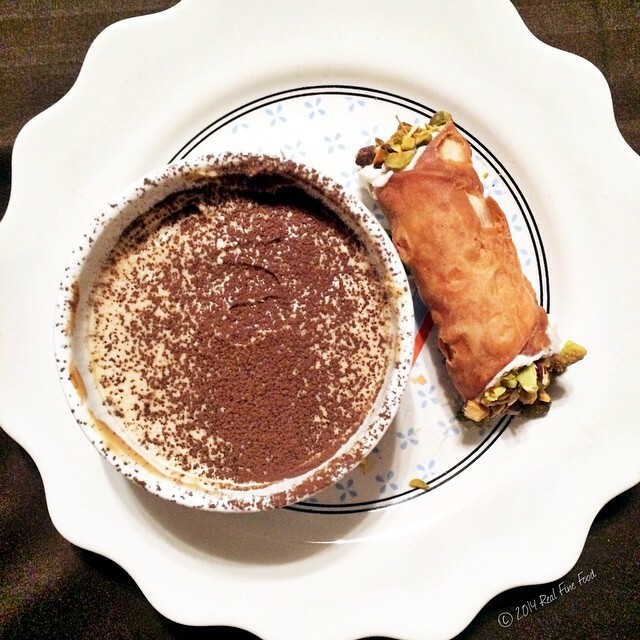 Orange pistachio cannolo and amaretto tiramisu. Image courtesy of Stephanie Casey. An epic menu to celebrate an epic film. But wait…there’s a Godfather 2…and 3. Will there be FRANK encores of this theme? Only time will tell. Thanks for reading, feel free to comment below, and subscribe to my blog in the upper right corner of your screen so you don’t miss any of my excessively wordy food blogs!